This post is for Sandy, who asked me for the recipe when I made it in France. 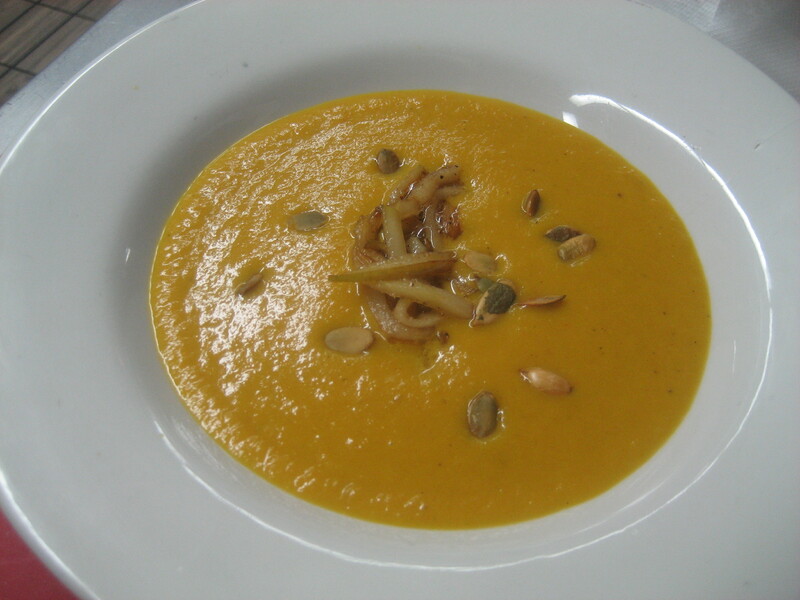 I made butternut squash soup again when I got to Santa Barbara – it’s so good! Perfect warm-weather soup that has is rich, savory and perfumed with spices. I pierce the squash with whole cloves before roasting, which makes the flesh fragrant and adds another dimension of flavor. Preheat over to 350º F. Cut squash in half (watch your fingers – the skin is very dense). Brush cut halves with olive oil, sprinkle with salt and pepper. press pointed part of cloves into flesh, spacing cloves apart. Do not use more than 3-5 per halve – the whole spice is very strong! Wrap each half in foil and pop in the oven. After 30-40 minutes, poke squash with fork – the flesh should fall apart easily. If it doesn’t stick it back in the oven. If it’s soft, scrape the insides out, leaving the skin behind, and put aside in a bowl. In a saucepot, melt butter or olive oil and add root vegetables, then a pinch of salt. (Salt helps draw out the moisture). Sweat vegetables on low heat, until translucent. You can add a few cloves of garlic if you’d like. If you’re in a hurry, you can skip this step and simply add a bouillon cube to soup. Scrape flesh from squash halves into saucepot, and add water until you get a soup consistency. Simmer for about 15-20 minutes to meld flavors and heat soup. Use stick immersion blender or dump contents into a blender and blend until smooth. Adjust seasonings with salt, pepper, cinnamon, freshly ground nutmeg, or sometimes I use Tony Chacheres seasoning salt. Garnish with toasted pumpkin seeds or pine nuts, caramelized apples, or sour cream or yogurt. Perfect with a green salad and some crusty French bread. Julienne apples into thin strips (about 1/4 inch by a 1/4 inch by 2 inches). Granny Smith and other tart apples are best, but any apple will do. Combine apples, butter, a spoonful of sugar and a dash of cinnamon in a small saucepan. Heat until sugars caramelize and apples are tender. Previous story Back in Sunny Southern California – AMERICA!